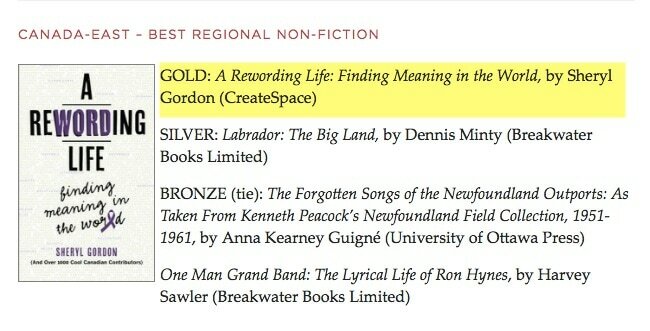 IPPY GOLD - A Rewording Life wins IPPY Gold for the category Canada East - Best Regional Non-Fiction. NB: IPPY stands for Independent Publisher Book Awards. CBC Moncton Ballyhoos A Rewording Life for World Alzheimer's Day. Personally, I think we should rename September 21st World Dementia Day (dementia is, after all, the more inclusive term). Thoughts? This Week in America radio interview with Ric Bratton. The Alzheimer Society of Toronto rewards A Rewording Life. This retweet didn't go viral like some of Margaret Atwood's other endorsements but it did create some ripples. Feel free to add your own rings. I pinned said tweet to my Twitter profile. Click here to read other reifying reviews.